Your dog needs a custom made coat to keep warm, from head to tail. This coat will fit! It will keep the ears covered, be easy to put on and tailored to order. Take some measurements, pick a color and we are on our way to a warm and happy dog. 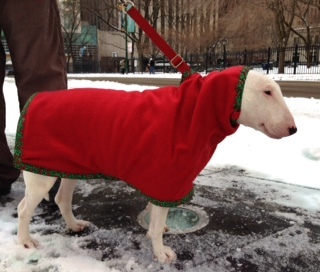 And if your dog prefers to keep the ears uncovered, just scrunch the coat down or we can design it without ear covering. 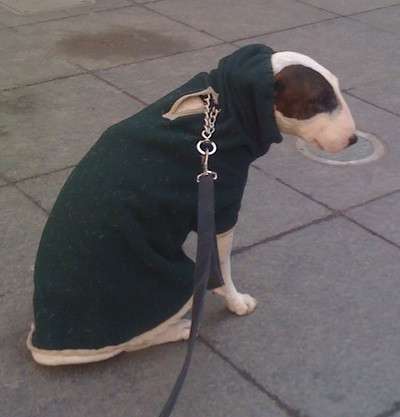 Coats have an opening for easy leash-to-collar connection. The "Hogan" The original, created by a friend, for "hard to fit" Hogan. The "Angie" Classic style, covers the ears, lined, easy leash access. 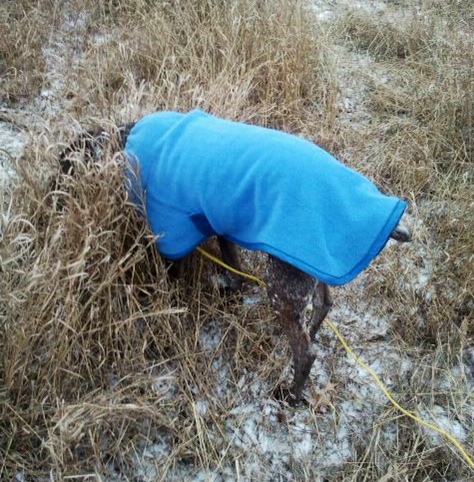 The "Oliver" For those who want their head and ears uncovered -- better for sniffing out a rabbit hole. The "Hogan" The "Angie" The "Oliver"